The Swan 60FD is a racer cruiser or a fast cruiser depending on who you ask. It doesn’t lack creature comforts and Good Call is a comfortable ride. Water maker,, air conditioning, generator and push button winches make sailing her a pleasure, and not a chore. She is the 4th yacht Tom Barker has owned, A J-124, a J-145 and a J65 all named Good Call preceded her. They came prepared. To be pampered. 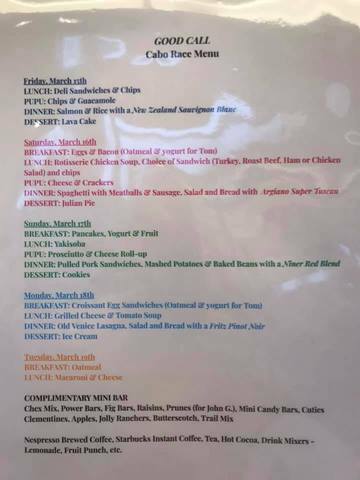 The crew of 9 were in for a treat, no freeze-dried meals on this tour. Nightly wine pairings with main courses of Salmon and Sauvignon Blanc, Spaghetti with meatballs and Argiano Super Tuscan, Lasagna with a Fritz Pinot Noir. Breakfast of Bacon and eggs, pancakes or croissant. Nightly pupus. Homemade Ice Cream on the last night. It was rough. 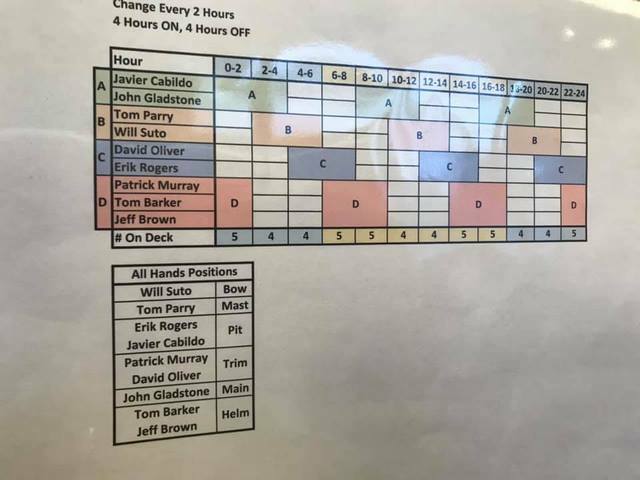 The crew of nine, David Oliver, Jeff Brown, Tom Barker, John Gladstone, Tom Parry, Patrick Murray, Erik Rogers, Javier Quiroz, and Will Suto would start with 6 other boats in ORR 3 on Friday, along with 4 SC 50/52’s. Her rating 0f 1.1378 was the highest of all boats in the division but she is not light and would need the optimal conditions to live up to the appointed number. 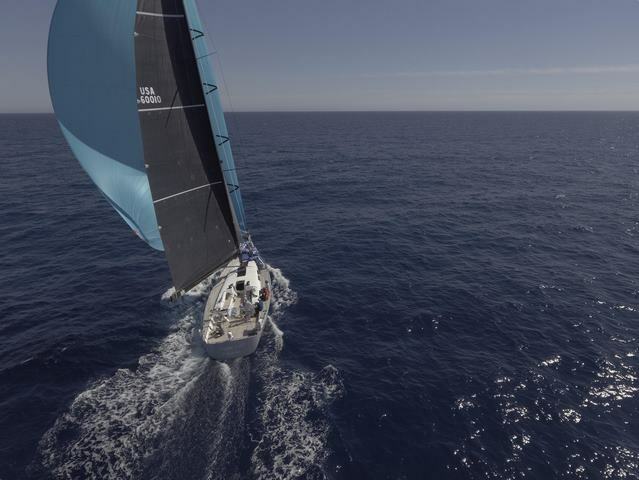 She had just been outfitted with a new deeper keel and racing boom to upgrade from cruising mode to offshore race mode, a new quiver of sails delivered just days before the March 15th start. A kelp cutter and massive running rigging tune up and electronics upgrade in the weeks leading up to the race. The Friday start was the best of all, and ORR 3 had wind the entire trip. Mostly in the 8-12 knot range. Dropping to 5 knots for just a short spell. “We started with #2 then 2A, Code Zero then to 3A thereafter between 1A 2A and 2.5 never took the kites down till finish” Jeff recalls. The 54’10” waterline really loving the wind range and the seas stayed well behaved the whole way. While the Saturday and boats suffered light air sections, the Friday starters were blessed from start to finish. Thursdays ORR 5 fleet had respectable returns in smile per mile and for a while, it appeared that the line honors would emerge from within that group. Good Call would jump to the front of the Friday fleet by the San Diego/Mexico border and stay well on the outside of the rhumbline until just south of Bahia Tortugas and then bounce in and out just west of it the remainder of the race. 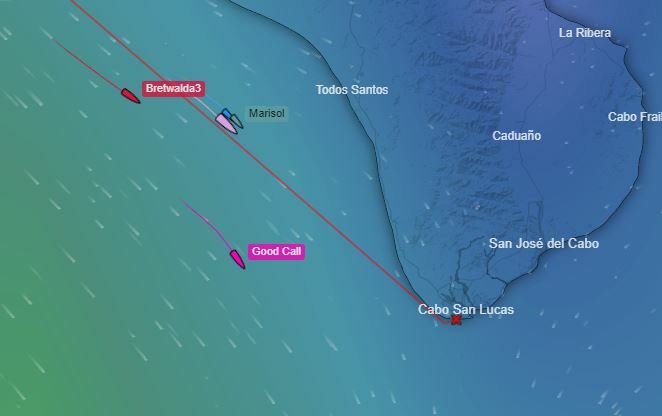 She reeled in Onde Amo early on Sunday morning and finally passed Aloha west of Puta Abreojos and was even with the 3 lead boats by Puerto Magdalena. She passed remained outside of them the rest of the way. With John Gladstone and David Oliver calling the tactical shots, and the crew performing gybes and trim with near perfection, Good Call was now on a mission. 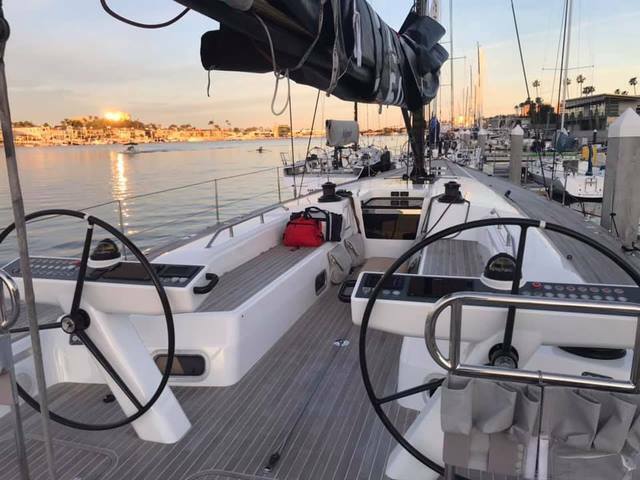 "SD Boatworks was honored to be one of the companies chosen to carry out the modifications, upgrades and commissioning of the Swan 60 “Good Call”. During this process the yacht was put into racing trim, and prepared for offshore racing, something it had never done before. 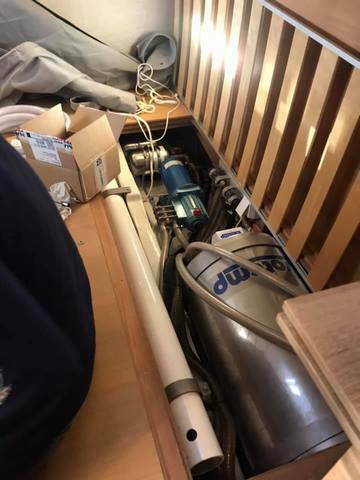 The complexities of a yacht of this caliber come from the integrated systems, that when set up properly allow the yacht to function with fingertip control, but every one of these functions needs to be serviced, tuned and adjusted with very little margin for error. Among other tasks, SD Boatworks refined and tuned the onboard sailing systems including the powered winch system, push button hydraulics system, the running rigging and soft attachments. 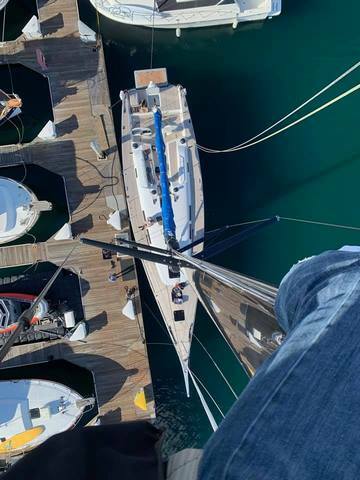 No detail was ignored and every system was tested rigorously both at the dock and under sail during sea trials where the SD Boatworks team worked side by side with the sailors to ensure that the functionality and reliability were up to the standards required for the race. 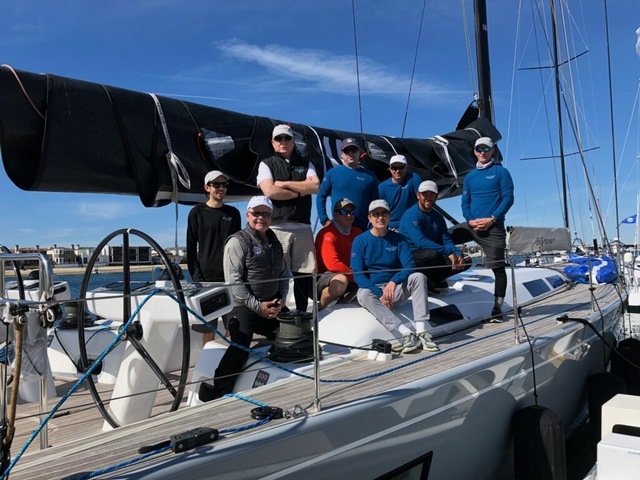 The results of these efforts are a boat that is not only fast, but also very enjoyable to sail with precision systems that put every control at the fingertips of the crew." "SD Boatworks is a San Diego based Rigging Shop that specializes in both racing and cruising sailboats. 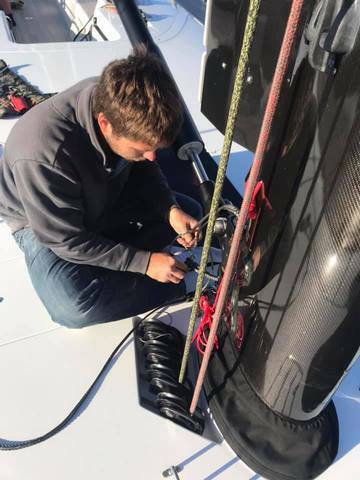 Along with their local service business, SD Boatworks is also the West Coast distributor for Marlow Ropes, which they ship to customers nationwide ranging from small rig shops to Grand Prix race programs as well as club racers on both coasts and in the Great Lakes. You can learn more about them at their website, SDBoatworks.com"